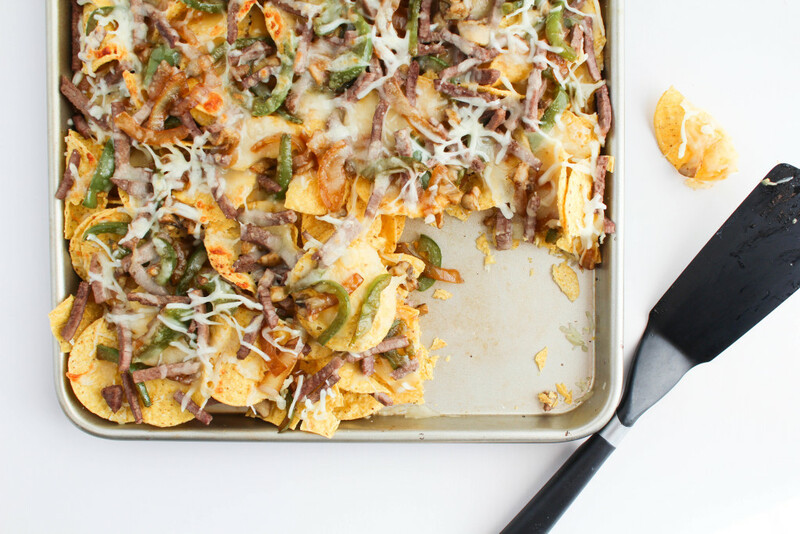 These Philly cheese-steak nachos are pretty easy to throw together and you can make an entire pan (or two!) at a time, so you won’t have hungry fans hanging around the table waiting for food. They are really yummy and are easy to customize if you don’t like certain ingredients or want to add a little something extra. Add the vegetable oil to an iron skillet or pan and heat over medium-high heat. Season your steak using salt and pepper on both sides and then add into the skillet. Cook for about one and a half minutes on each side or until cooked through. 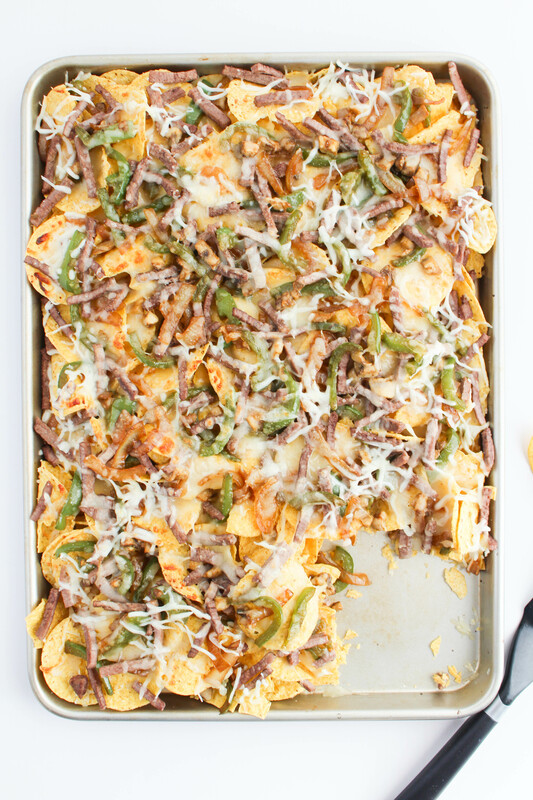 Next, slice up the green pepper, onions, and mushrooms into bite sized pieces. 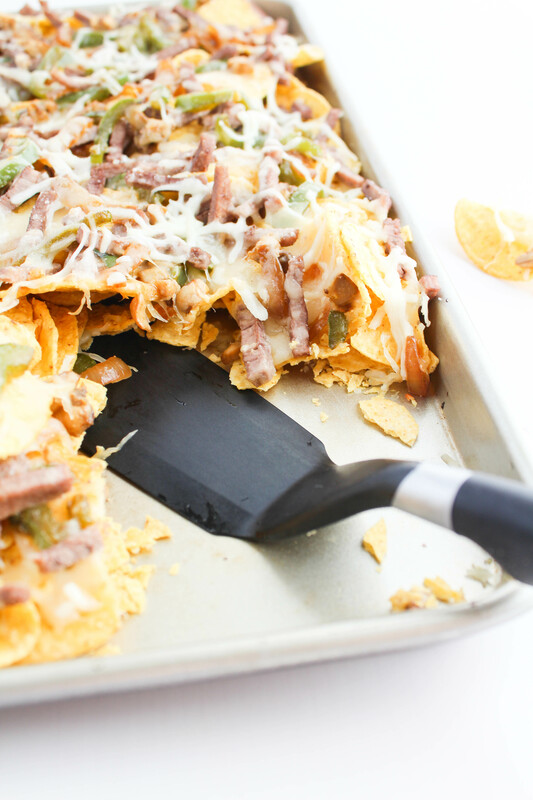 You can choose to make them bite sized or cut them into longer slices, to replicate the style of a traditional Philly cheese-steak. Add them to your skillet and season with seasoning salt to taste. Cook through until onions are translucent. Remove from heat and set aside. Once you steak is cooled, cut into small slices and set aside. Now, it’s time to assemble the best part….the nachos! Turn on your oven broiler and set the temperature to 400 degrees. I choose to go with a lower heat setting for the broiler so that the cheese doesn’t melt and burn too quickly. 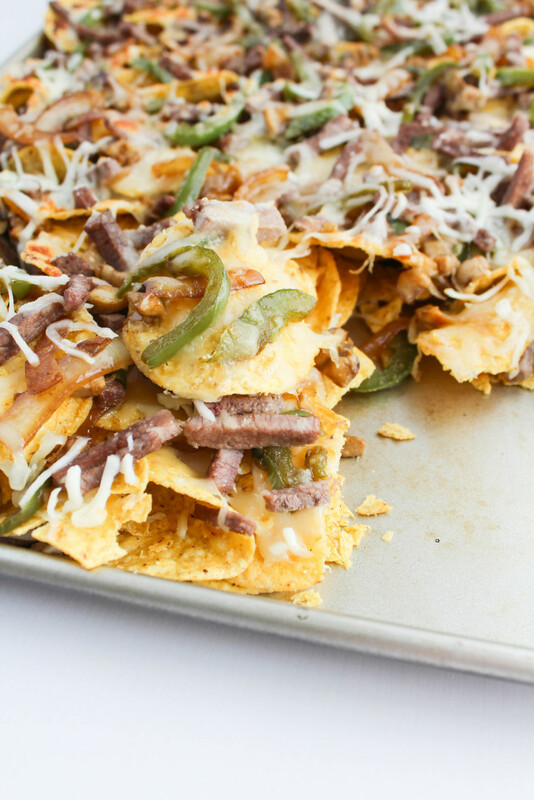 Using a baking sheet, fill with tortilla chips. Fill in any open gaps or holes where the baking sheet shows through. Cover chips with about half of your cheese. Top with the grilled vegetables and the sliced steak. Put your tray into the oven and broil for about 5 minutes or until cheese is bubbly and melted. 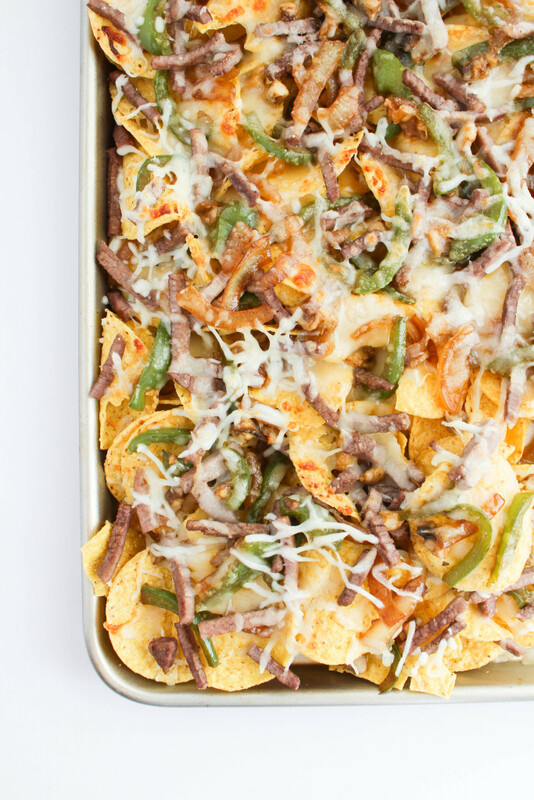 If you like your Philly Cheese-steaks topped with cheese wiz, drizzle warmed cheese over the top of your finished nachos after removing them from the oven. 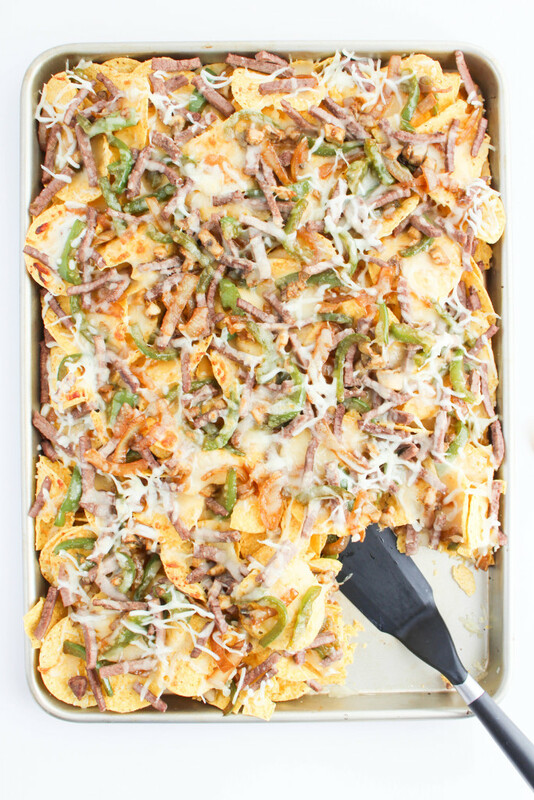 Serve on the baking sheet with a spatula and enjoy! These Philly cheese-steak nachos are a breeze to put together and making a whole sheet at a time is the perfect way to get your favorite fans fed on game day!